See the list of native plants sales in North Texas kicking off next month. Above, Blue aster is a pretty Texas native perennial. Courtesy of the Lady Bird Johnson Wildflower Center/R.W. Smith. When it comes to gardening, the environmentalists' mantra has long been "plant more native plants." The Native Plant Society of Texas, headquarted in Fredericksburg, was an early promoter. Founded in 1981, it's been encouraging conservation, research and the use of native plants for almost four decades. Native plants typically are more drought tolerant and require less water than exotic species. They also provide food for pollinators, caterpillars and other wildlife. 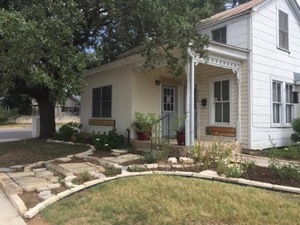 The Native Plant Society of Texas headquarters in Fredericksburg. Courtesy of NPSOT. Dr. Doug Tallamy, a professor of entomology and wildlife ecology at the University of Delaware and author of Bringing Nature Home: How You Can Sustain Wildlife with Native Plants, said native plants and the insects that have co-evolved with them are at the heart of every ecosystem. Tallamy says most of us were taught that gardening is a way to express artistic talents, improve a property's appearance and provide a place to relax. That's a lovely but limiting belief that has gotten us where we are today - facing the threat of climate change and the sixth mass extinction. Unwittingly, since our country's founding, Americans have been replacing native plants with highly invasive plants that provide almost no food for wildlife. "We have to recognize that plants are more than decoration," he said. "We’re forgetting the other things they do." We're fortunate to have several chapters of the Native Plant Society of Texas in our region along with other institutions dedicated to promoting native plants. The sales kick off in April, so save room in your garden! April 6-8, DALLAS - Butterfly Plant Sale will be held at the Texas Discovery Gardens 10 a.m. to 2 p.m.
April 6-7, FORT WORTH - Fort Worth Botanic Garden Spring Plant Sale's annual sale will feature a variety of native and adapted plants. 2 p.m. to 7 p.m. on Friday, 9 a.m. to 2 p.m. on Saturday. April 7, FLOWER MOUND – Spring Festival sponsored by Keep Flower Mound Beautiful at Flower Mound High School. The Native Plant Society of Texas' Trinity Forks Chapter will have plants for sale from 10 a.m. to 1 p.m.
April 14, DALLAS - Spring Plant Sale hosted by the Greater Dallas Organic Garden Club will feature a variety of Texas native and adaptive perennials, nectar and host plants for beneficial pollinators, herbs, veggies, ornamentals (house plants), rare pass along plants, succulents and garden related goods (books, pots, shepherd hooks, trellises and garden deco odds and ends). 9 a.m. to 2 p.m.
April 14, CEDAR HILL – Native Plant Sale is hosted by Dogwood Canyon Audubon Center, 10 a.m. to 2 p.m.
April 14, WEATHERFORD – Weatherford Blooms Festival. NPSoT Cross Timbers Chapter will have a booth selling plants at the event, 10 a.m. to 4 p.m.
April 14-15, MCKINNEY – Heard Museum & Wildlife Sanctuary’s Spring Plant Sale has been touted as one of the largest and best native plant sales in the state. 9 a.m. to 5 p.m. Saturday, 1 p.m. to 5 p.m. Sunday. April 21, DALLAS - The Dallas Chapter of the Native Plant Society of Texas' Spring Plant Sale will be held at Good Local Market, Garland Road, 8 a.m. to 1 p.m.
April 28, BEDFORD - Keep Bedform Beautiful is hosting its Annual Plant Sale with Farmers Market at 6 Stones/Bedford Urban Farm from 9 a.m. to 4 p.m. Texas native and adapted plants for sale, along with herbs and succulents. May 5, ARLINGTON – The North Central Texas Chapter of the Native Plant Society of Texas hosts their annual Spring Plant Sale at River Legacy Park from 10 a.m. to 2 p.m. 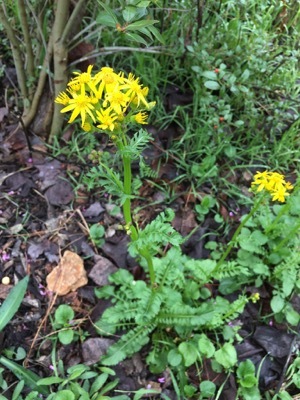 Above, Golden groundsel is a yellow shade plant that is native to Texas. Photo by Julie Thibodeaux. Don’t see one of your favorite native plant sales on the list? Email Julie@GreenSourceDFW.org.